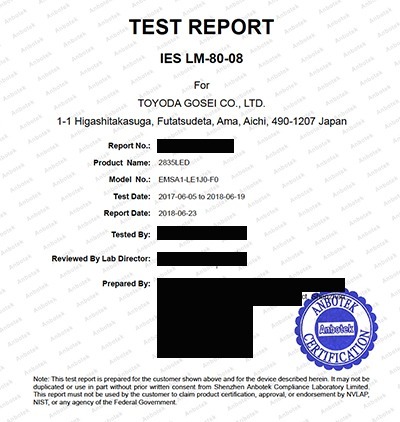 It is the Illuminating Engineering Society of North America (IESNA) approved standard for measuring lumen maintenance of LED light sources. LM-80-08 apply to the LED package, array, or module alone, not a complete system, it is testing a component level. The standard does not provide guidance for extrapolation of testing results. LM-80-08 testing should be performed by EPA recognized Laboratories. Only reports from recognized laboratories are relevant. This standard is used for Department Of Energy (DOE) ENERGY STAR program early qualification in conjunction with other reports. 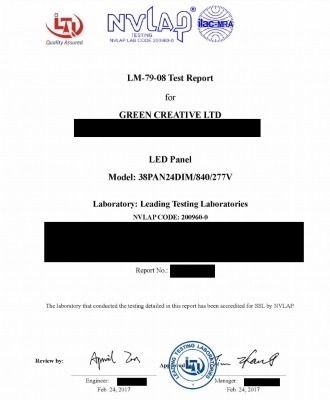 Most GREEN CREATIVE product use LED with available LM-80-08 test report from recognized laboratory. It is the Illuminating Engineering Society of North America (IESNA) approved method for the Electrical and Photometric Measurements of Solid-State Lighting. It measures an LED luminaire or integral lamp as a whole system according to a standard process using specified equipment. LM-79-08 testing should be performed by EPA-Recognized Laboratories for the category of product tested. Only reports from recognized laboratories are relevant. This standard is used for Department Of Energy (DOE) ENERGY STAR program qualification and lighting facts advocate program. 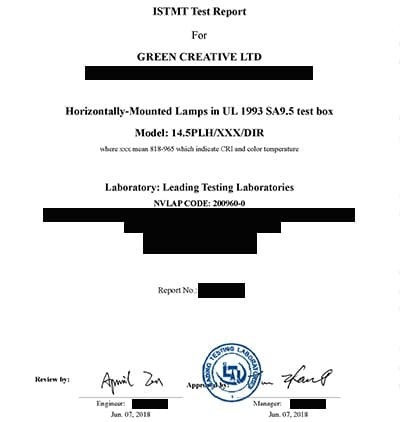 All GREEN CREATIVE product testing are performed according to LM-79-08 in an EPA recognized laboratory and reports are available upon request. It is the Illuminating Engineering Society of North America (IESNA) approved method for taking LM-80 data and making useful LED lifetime projections. The standards apply to lifetime projection of LED package, array or module alone. The results can then be used to interpolate the lifetime of an LED source within a system (luminaire or integrated lamp) using the in-situ LED source case temperature. There is not such a thing as testing, it is a mathematical method based on LM-80-08 collected data. The method will provide a projected lifetime for the LED source or system. It is the measure of the LED source case temperature within the LED system (luminaire or lamp). Put simply, it is the temperature of the LED within the luminaire. The measurement has to be performed according to the temperature measurement point (TMP) indicated by the LED package manufacturer. OSHA approved NRTLs or DOE CALiPER Recognized or UL Data Acceptance Program laboratories. It can be performed at the same time as LM-79-08. All GREEN CREATIVE products go through ISTMT in an EPA recognized laboratory and reports are available upon request. Once ISTMT is known, we check if the temperature within the luminaire is within the temperature of the LM-80-08 LED source report. It is then the basis for lifetime interpolation either based on TM-21-11 or other method.